The green juniper in our gin comes from the Hepple estate. Unripe green berries have a very fresh ‘green’ taste whilst also offering up unique ‘woody notes’ of sandalwood and cedar. Picking our green juniper is rather less straightforward than for other botanicals, each individual bush varying in readiness at any given time. We harvest from late August to November. Juniper is part of the conifer family and on close inspection you will notice that it has tiny needles. The ‘berries’ are in fact cones. For the ‘ripe’ juniper in our gin we use 2 strains: the Macedonian provides the classic juniper punch whereas the Italian juniper lends a sweetness and lighter floral element, a daintier offering: the ballerina and the bruiser so to speak. 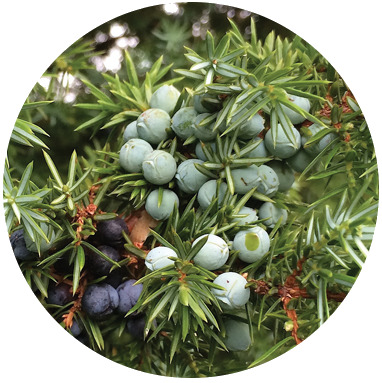 The Macedonian strain is also used in our critical extraction process as one of 3 expressions of juniper to be found in Hepple gin. Purple cones from the Hepple bushes are presently used for our propagation project. This conifer is actually not a true fir but a pine. It is planted for it’s excellent timber and grows in abundance at Hepple. The needles however are of particular interest to us. Picked and rubbed in the hands, smelt then nibbled the fresh needles have a strong resemblance to grapefruit in both scent and taste. Once dried the needles change their character offering a perfume and flavour of strawberry and melted candy. We seek out both these characteristics of fresh and dried. We harvest the needles in September. The blackcurrant leaf provides a remarkable offering. Picked and then dried before distillation its taste is faintly sour with a bright and clean freshness. More important is the quenching ‘chewiness’ that it lends to the mouthfeel. We use Blackcurrants for their perfumed skin and combined sweet and sour fruit pulp. They give a real zing, an absolute freshness and ‘juiciness’ to the gin. A herb once fairly well known in the British cookery any widespread use in the kitchen now mainly found in Scandinavia. Related to celery the taste and perfume is however more complex with a strong savoury, curry like twang in its leaf. Due to its lively character small amounts are used in our recipe, but is essential for the complimentary links it makes to the other ingredients. This lemon from the South West coast of Italy is famous for it highly perfumed and delicate fragrance. It’s floral notes offer a wonderful ‘lift’ over other lemons whilst also giving us consistency in flavour. We were surprised and delighted to find coriander seeds grown commercially in the UK. Compared to their overseas cousins, we found our UK sourced coriander to be richer in warm orange perfume and taste while retaining that necessary delicate spiciness. Alongside lemon, together they combine to make a wonderfully full citrus spectrum providing their warm orange base to lemon’s high note ‘ping’. Stronger in it’s fennellish attitude than the delicate fennel bulb this seed provides an aniseed fine edge to the flavour profile of Hepple. Although a small contributor, it has a very complementary relationship with the other ingredients. Our liquorice is supplied to us by Lakrids in Copenhagen, who are without doubt the makers of the finest liquorice confectionary in the world. We buy their liquorice powder, not the shredded root, as this helps us get a very precise dose into the still. Liquorice balances the gin with deep, faintly bitter yet sweet and savoury notes lending not only to the flavour but a lasting mouth feel. This stubborn, almost stone like dried root from the Iris works as a binding agent helping all the ingredients in our gin to link arms and integrate. It has a very subtle smell of violets, an unmistakable dryness and a faint woodiness. In gin the root is used to provide ‘grounding’ as a bitter and dry and earthy stabiliser.